← Jon Cohen Experimental Show Covered in Windsor Star – Nice. This show on Friday will be a definite alternative to the norm on a weekend evening. 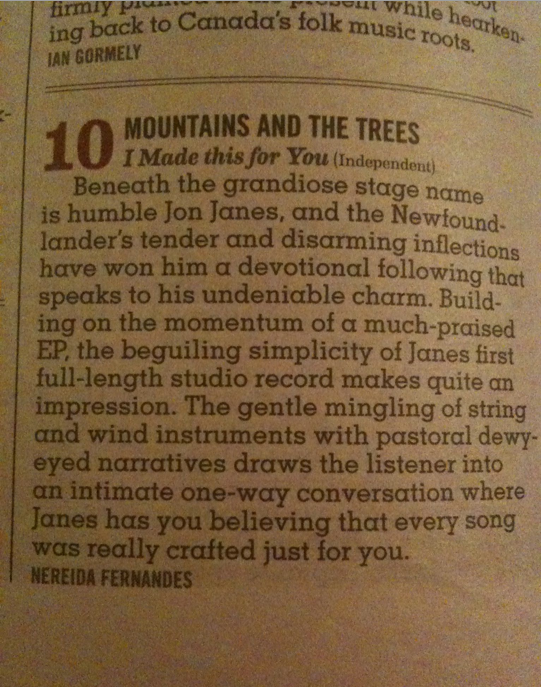 Recently, Jon Janes, of The Mountains and The Trees was ranked on the Top 10 of Exclaim Magazine’s 2010 Year in Review for Folk & Country. Here’s the proof. Number 10. It’ll be a great show, comprised of really great people. My guess is that people will be coming from far and wide for this one. $5 Cover. Worth every heightened dollar. This entry was posted in show promo and tagged 2011, Crissi Cochrane, Exclaim Magazine, Jon Janes, The Mountains and The Trees, Zachary Lucky. Bookmark the permalink.